Do you find yourself using your tablet and/or smartphone to do tasks you once did on your computer? You are very definitely not alone. According to a new report from the NPD Group research firm, computer owners are spending more and more time with their mobile devices. 37 percent of respondents to the survey said that they are transitioning multiple different tasks to their tablets and smartphones, with Internet browsing and time spent on Facebook leading the way. Of those using a tablet, 27 percent said they are using their PCs less frequently to access the Internet, and 20 percent are spending the majority of their Facebook time on the site by accessing it on their slates. Among smartphone owners, the number using their PCs for those two activities stands at 27 percent each. The third place activity on tablets was a tie between playing games and reading, while third place on smartphones was uploading photos. PORT WASHINGTON, NEW YORK, FEBRUARY 07, 2013 – Content that was once primarily accessed by consumers on their PCs, is shifting to mobile devices. 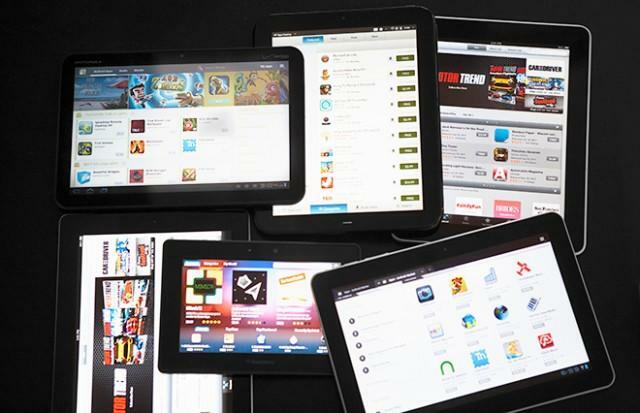 According to the Connected Intelligence Application and Convergence Report from global information company, The NPD Group, 37 percent of consumers who used to access content on their PCs switched to their tablets and smartphones. The top two activities that consumers are shifting from their PCs to their tablets and smartphones are web browsing and Facebook. Among tablet owners, 27 percent say they are using their PC less frequently for accessing the Internet and 20 percent say they are using their PC less frequently for accessing Facebook. Twenty-seven percent of smartphone owners have decreased both their Internet and Facebook usage on their PCs because they now use their smartphone for these activities. Consumers are still using their computers for many of the core PC-centric activities, but the tablet and smartphone are gaining traction. 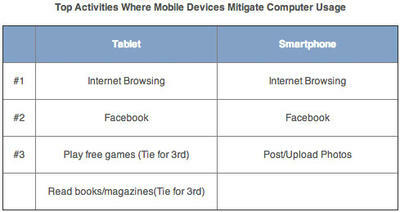 Internet browsing is still highest among PC owners at 75 percent, smartphones at 61 percent, and tablets at 53 percent. Facebook interaction follows the same rank with PC owners at 63 percent, 55 percent for smartphone owners and 39 percent among tablet owners. And, it’s not just mobile devices that are drawing attention from the computer; 21 percent of consumers that have a TV connected to the Internet are now switching from their computer to using their TV to watch video from streaming services such as Netflix, Hulu, or Amazon Instant Video.